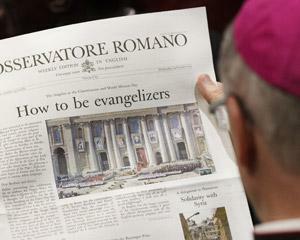 Last Fall, the Catholic Church had the important Synod of Bishops on the New Evangelization. Bishops, lay people and other leaders – both within and outside the Church – gathered to explore an important question: How do we communicate Jesus to 21st-century-people, to a world full of complexities? We need to revisit this question on a regular basis. This is not a question that will be answered by a single synod. Nonetheless, this Synod was an important moment that explored the language we use to proclaim Jesus Christ Crucified and Risen, and tried to deepen the impact of that language on our world. Upon the completion of the Synod, there was great enthusiasm about what it accomplished, but there was also some frustration. One of the most pronounced criticisms was that very little was said about the Church’s commitment to social justice. A possible response to that criticism may be that there’s no need to learn how to evangelize justice. If we learn to communicate our faith more effectively, people will learn a faith that also teaches and does justice, and they will practice that justice. This idea works in theory. There is no doubt that faith and justice are very deeply connected, and the two should feed of each other. However, in reality, they often do not. It’s not uncommon for people of deep faith to be apathetic towards the Church’s works in social justice, nor is it uncommon to find Catholics who are community activists concerned with justice, but with very little spirituality in their lives, or with a blatant disregard for Church doctrine. I’m sure many have addressed and written about this topic. This particular issue is the subject I’ve chosen to write about as part of my Synthesis Paper (my final paper) to complete my studies at Regis College. This is a 40 page pager that will hopefully look at the question, “How can we communicate both faith and justice to the faithful?” It’s a specific focus. I’m not looking at how we can deepen people’s faith, or how to bring lapsed Catholics back to the faith. I’m arguing – as many have before me – that before we can speak of evangelizing the world, we need to evangelize ourselves. We need to take a good look at who we are as the Body of Christ, and to renew ourselves in accordance with what our faith asks of us, but also to keep ourselves in tune with the needs of the world we live in. In short, we need to understand what it means to be a disciple of Christ, and how we can act in our world as disciples. To achieve this, I will eventually turn to the likes of Bernard Lonergan, Gustavo Gutierrez, Gandhi and others. For the time being, I’m looking at Evelyn Underhill, and her book Practical Mysticism. I’m exploring her ideas and contemplating how they may fit into my study of evangelizing justice. One idea of hers that correspond to my scope is that she challenges 20th century people (to whom she addressed her book) to step outside of their subjective view of the world, and to let their senses tell them what the world really is. This message, which obviously applies to us as well, can be expressed differently: We should not always rely on our mind, our opinions, our biases, our cultural baggage to understand the world. Our senses reveal a lot of valuable information to us: we need to reconnect with what they are telling us. This is an interesting position, one that even seems as a partial rejection of the human intellect, which she believes clouds our efforts to understand the world. But she does not ask us to abandon our insights, thoughts and judgments of the world. She asks us to reconnect with our senses to get a more balanced view of the world we live it. I’ll be spending the next few months trying to go deeper into her standpoint and thinking. I’d like to explore if her ideas can in any way be integrated in a broad effort in the 21st century to encourage people to appropriate a pragmatic kind of mysticism that could lead them on the path to a deeper practice of their faith, and of justice. I look forward to hearing comments about this, as it may well become one of my life long interests. Thank you for your prayers and support in this process.